Usually, we have cold cuts, marmalade, and bread for breakfast here in Germany. If I have an examination or I have an important event in the morning, I would still cook this meal that I’ll be going to share in this article. Warm breakfast enables me to function well and I don’t know- it’s give me enough energy to survive all activities within a day. I can have late lunch at 3 or 4pm or I may even skip dinner once I have this hearty breakfast. It is a short term for Tapa (beef), Sinangag (fried garlic rice), and Itlog (egg). I started to become a fan of this meal when me and my family lived in Tondo. We were there for about 8 years. The place might be known because of the squatters’ area or the smokey mountain, but I tasted the most delicious and affordable meals there. I recalled that we just needed to pay 20 pesos (0.40 Euros) for this meal. 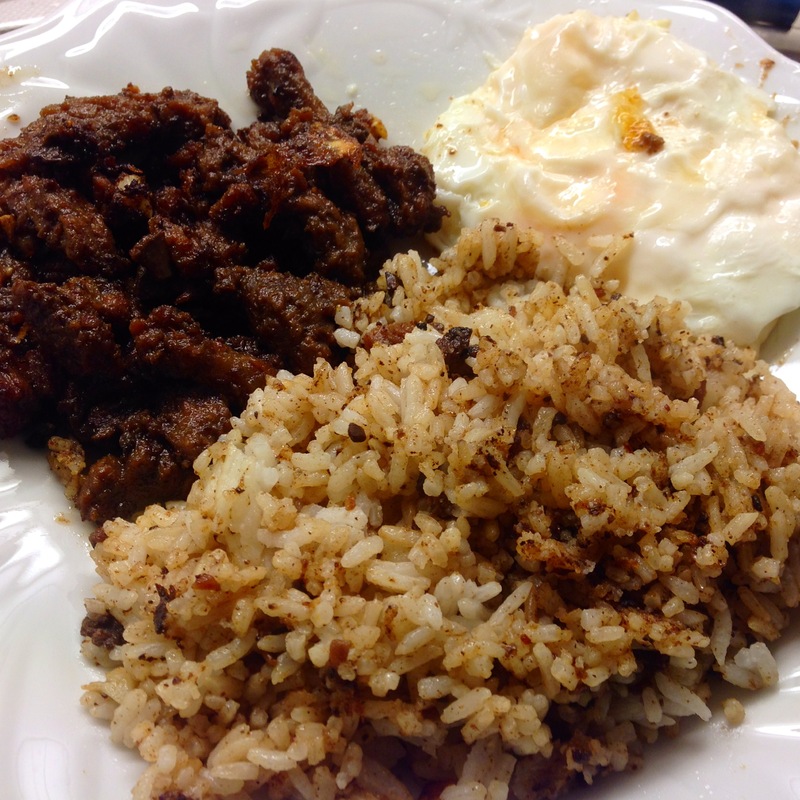 Let me share to you my recipe on how I recreate the taste of Tondo’s TapSiLog that I experienced. Sauté garlic until golden brown. Then, cut the beef into strips and add it in the pan. Wait until the flesh is cooked from the outside. Add water. Put the soy sauce, sugar, salt, pepper, and oyster sauce (adjust based on your preference). I recommend to boil it for 2 hours until the beef is really soft and all the flavors are in the meat. You have two options for the fried rice. My mother would usually, take out the beef from the pan. While it is hot, she will put the rice in the same pan. Or you can use a clean pan. Put oil, sauté garlic until golden brown then add rice. Put a little bit of salt to taste. Put the fried rice, beef, and fried egg on the plate. Served the dish with vinegar as a condiment. ← Tracks: Decision. Journey. Destination.